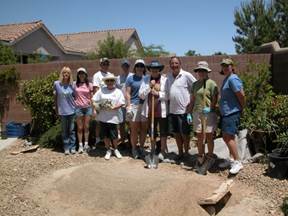 Dig a wedge 6′ long and 34″ – 36″ wide. 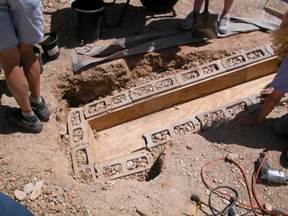 Dig one end 24″ deep, sloping up to ground level (Figure 1). Place a 4-mil plastic sheet flat on bottom of hole. Cut plywood to size and place the in the hole, with the turnaround at the deep end. Fold the plastic over the edges of the plywood, and trim to leave the channel free of plastic. Place blocks on plywood (and plastic) in the pattern shown (Figure 2). Line the blocks with plywood. Fasten with screws DO NOT USE GLUE. Be sure the wood is tight and does not have a spot for a tortoise nail to get hooked. Add boards to narrow the channel, if needed. Fill the blocks with dirt. Add filtered dirt to channel bottom to create correct height in channel. Place 11/2″ Styrofoam layer on top of blocks (to add height for growth) if needed. Place a second sheet of plywood over the channel (Figure 3). DO NOT ADD A SHEET OF PLASTIC – it creates a greenhouse effect. Fill with dirt, packing down somewhat as you go. Mound dirt so that it covers the seams created when digging. Smooth the top. Mist lightly with water (Figure 4). Figure 1. 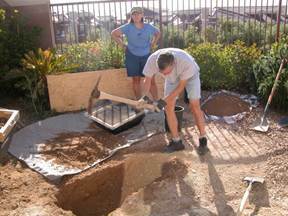 Dig a wedge 6′ long, sloping from 24″ to ground level. Figure 2. Place cement blocks on plywood in pattern shown and line with plywood. Figure 3. Cover completed channel with plywood. Figure 4. Fill in with sifted dirt and mound to cover excavated edges.